Earn $10 From Your Mobile Device!! 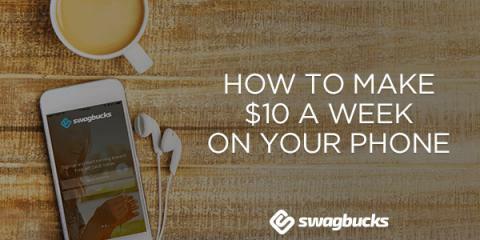 By downloading the Swagbucks mobile app, I can earn a free $10 gift card by the end of my week. Who knew playing on my phone could be so productive! Invite your friends to download the Swagbucks Mobile app so they can start earning their way to free gift cards. It's 100% free to download and 100% easy to use. Its available for both iPhone and Android devices. Not a Swagbucks user yet? Don't miss out on these easy to earn opportunities. Sign up today! Disclosure: This is a sponsored post on behalf of Swagbucks. Links in this post contain my referral information and I will earn for signups. I am a longtime user of Swagbucks.